Between illness and personal tragedy, Michael Woods could have written off 2018. Instead, he climbed to success at the Vuelta and worlds. Somehow, after six and a half hours of up-and-down riding in the Alpine cold, the fatigue in Michael Woods’s legs was not the first thing on his mind on Sunday afternoon in Austria. The 31-year-old Canadian, who rides in EF Education First-Drapac’s kit for most of the year, was too busy pedaling through a state of disbelief. 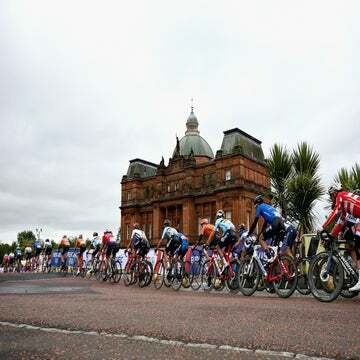 He was grinding up the final climb of the world championship road race alongside a tiny handful of marquee names, with the rest of the peloton shelled out of contention. Working his way up the “Highway to Hell” climb in Innsbruck, Woods was in with a shot at a worlds medal, maybe even a rainbow jersey. 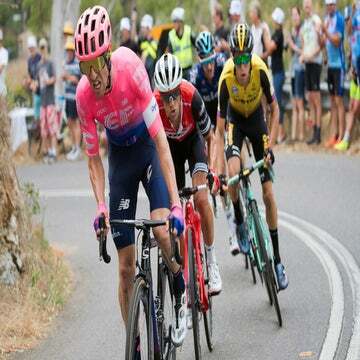 With notables like Frenchmen Julian Alaphilippe and Thibaut Pinot joining those dropped off the back on the steep gradients, Woods found himself in some very select company as he pushed his way toward the summit with France’s Romain Bardet, Spain’s Alejandro Valverde, and Italy’s Gianni Moscon. Upon reaching a steep section of the course he remembered well from his recon ride, Woods figured he might as well hit the front. He went on the offensive with a punchy attack, and only Valverde and Bardet could follow. Two months prior, Woods was struggling through the Larry H. Miller Tour of Utah, but here he was applying pressure to some of the very best in the world on a massive stage. MIKE WOODS ULTIMATELY RODE TO THIRD OVERALL, a bronze medal, at the Innsbruck world championships. Not bad for a guy who only took up competitive cycling in his mid-20s. No, it’s not a world title, not the career-defining win that Spain’s Alejandro Valverde will celebrate every day he dons the rainbow jersey for the next 12 months — but nonetheless, it’s a huge result for Woods, who battled through a season of ups and downs amid what he describes as the most emotional year of his career. Few could have blamed Woods if he had decided to pack it in this fall, trying to put a difficult summer rife with personal and professional challenges in the rearview mirror, with an eye toward a fresh start next year. Instead, he rode his way into shape and claimed a stage victory at the Vuelta a España, and held that form into Innsbruck to snag Canada’s first medal in the worlds road race in over 30 years. In the process, he’s made an undeniable statement: Mike Woods is no longer an up-and-comer — he’s one of the top puncheurs in the peloton, and he’s still getting better by the day. WHEN WOODS SNAGGED RUNNER-UP HONORS at Liège-Bastogne-Liège this spring, signs were pointing way up for his ambitions to knock the 2018 season out of the park. Instead, his next few months battered him with both professional disappointments and family tragedy. On the road, his hopes for a strong Giro ride evaporated in the second week, and his return to racing a few months later at the Tour of Utah saw him crash and ride to a quiet ninth overall. On the personal side, his wife’s father passed away, and as the couple was still trying to cope, they were hit with a new wave of grief when they had a stillborn child. Woods limped into the Vuelta a España in August with only a few races left on the calendar in what was meant to be a season to remember. A month and a half later, Woods can rest assured that this will be a year fans remember. Countless hours of planning went into making that a reality. If his difficult stretch from May through mid-August is a reminder of just how many curveballs life and cycling can throw at a person, what happened next was proof positive that, sometimes, the best-laid plans of bike racers actually do work out. Recovering from an illness and tragedy, and coming off a crash-marred, disappointing Tour of Utah, Woods was feeling “like absolute garbage on the bike” in August. He was not exactly champing at the bit to start the Vuelta. EF Education First sport director Juan Manuel Garate told him he should give it a go anyway. The way Garate saw it, Woods would be flying by week three if he went into the race without any GC aspirations, riding for Rigoberto Urán some days and hunting for stage wins late in the race. Garate’s plan worked. Woods’s form — and morale — improved dramatically over the course of the race. He stormed to his first ever WorldTour win and first grand tour stage victory atop the Basque Country’s Balcón de Bizkaia in stage 17. The biggest win of his career, it reinvigorated Woods at the tail end of what had been a tough season. With worlds approaching, he wasn’t going to stop there. Woods’s return to form was music to the ears of Cycling Canada. Performance director Kevin Field had been eyeing the Innsbruck worlds for more than a year. It had to be a judicious selection, with only four spots for Canada at worlds. Woods was ultimately joined by rouleurs Hugo Houle (Astana) and Antoine Duchesne (Groupama-FDJ) and fellow climber Rob Britton (Rally Cycling), all riders he knows very well. Cycling Canada’s worlds prep meant more than coming up with a race strategy. With help from B2Ten, a Canadian group dedicated to providing support for athletes in Olympic sports, and Woods’s trade team, the Canadian federation worked to make sure its athletes were in their comfort zones on race day. An EF Education First soigneur and a team mechanic were part of the support team. Cycling Canada arranged to share a team bus — on loan from women’s racing juggernaut Boels Dolmans — with the American squad, meaning that Woods was surrounded by riders he’d known for years on the morning of the race. THE CHILLY CONDITIONS IN THE EASTERN ALPS made for a shivery start, but the deafening cheers of a raucous crowd — with several of Woods’s family and friends along the road — and even the scenery gave Woods plenty of reasons to maintain that buzz he’d started the day with. That continued into the second half of the race as he began to notice how fresh he was feeling despite the tough day on the bike, and as Team Canada’s pre-race plan was unfolding to perfection. Just as Field had drawn it up several months prior, Britton had gone up the road with the early break and was still looking sharp as the race dragged on. With a man in the move taking the pressure off Canada, Duchesne and Houle were protecting Woods in the pack, with the expectation that Britton would be there for Woods later on once non-climbers Houle and Duchesne were out of the picture. By the start of the final lap on the Innsbruck circuit, Woods was exactly where he wanted to be: well-positioned in a rapidly dwindling pack and feeling fresh. He stayed patient as a few riders fired off late attacks on the penultimate climb. Patience paid off when lone escapee Michael Valgren (Denmark) was reeled in on the final climb. That’s when Woods decided to hit the accelerator. By the top of the climb, he only had Valverde and Bardet for company, all but guaranteeing him a medal if he stayed upright on the descent. The trio made it onto the finishing straight without incident, with Valverde in the unenviable position of leading into the final kilometer. 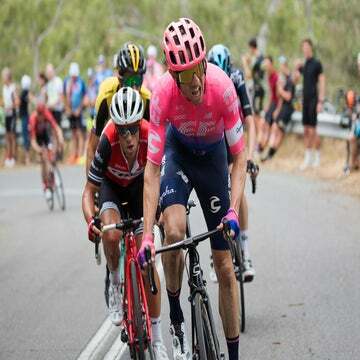 Dutchman Tom Dumoulin managed to bridge to make it a quartet in the lead, but Woods was not worried, knowing the effort Dumoulin had just put in would keep him from factoring in the sprint. Instead, he was thinking about a world title. Disbelief was turning to belief: Somehow, a rainbow jersey was within reach, with the pre-race favorite seemingly in the worst position for the sprint. Even against the speedy Valverde, Woods was confident in his chances to come around. Those final few hundred meters did not play out the way Woods hoped. Instead of coming around and throwing his hands in the air, Woods cramped up and watched Valverde ride into the rainbow stripes with Bardet taking silver. Woods took third. At first, the disappointment clouded out any other thoughts. BY THE TIME WOODS WAS MAKING HIS WAY TO THE PODIUM, frustration had turned to elation. Surrounded by family members and friends, he started to realize what he had achieved. Six weeks removed from the start of a Vuelta he almost skipped, grand tour stage winner and now worlds medalist Woods watched as the Canadian flag was raised alongside the French and Spanish flags. And then it really hit home. “I can relate to this because I wasn’t a cycling fan all my life: Canadians don’t get cycling at all. But they do get world championships and they do understand the gravity of a bronze medal,” he says. It took a few months longer than he’d hoped, but in his late-season push, Woods has confirmed what he hinted at this spring with a runner-up ride at Liège. When there’s a punchy climb to tackle at the pointy end of a race, he’s no longer the up-and-coming converted distance runner. He’s a legitimate contender, and he’s only getting better as he racks up more experience. The peloton is starting to take notice. Woods says he could already tell on Sunday that other squads were giving him more respect as he moved around the peloton. With a worlds medal now in his collection, he can expect even more of that going forward as he continues to hunt for marquee victories. Woods says he is not giving up on trying his luck as a grand tour contender just yet, but his strong one-day performances and his Vuelta stage win this year have nudged him in the direction of focusing more on classics and stage-hunting in the future. It won’t be long before he gets another chance to show his stuff. Woods is headed to the Italian classics this week, and he’s hungry for more. He finished second at Milano-Torino back in 2016. Il Lombardia awaits in a week and a half. Woods probably won’t start the season’s final monument as the top favorite — after all, newly crowned world champ Valverde is set to make the start — but he won’t be able to fly under the radar either. That’s fine with Woods. It’s further proof that he is continuing to progress as a pro. As of midweek following the world championships, Woods was still feeling good about carrying form into the final races of the season. If that holds into next week, expect to see him in the mix once again alongside the likes of Valverde and company — assuming he can manage to tone down his well-deserved late-season stoke for just a few hours each night.